Formula One driver Sebastian Vettel just signed a new three-year contract to stay at Ferrari, reports NBC Sports. Ferrari made the announcement after the final practice session for this weekend’s race at Spa-Francorchamps, confirming what we all expected to happen after Ferrari announced they’d be keeping Vettel’s teammate Kimi Räikkönen. Vettel’s contract was up at the end of this year, so it was simply about that time. While it’s a no-brainer for Ferrari to keep the guy who’s currently leading the F1 world driver’s championship, there was some speculation that Vettel might only opt for a one-year contract in hopes of nabbing a better deal in 2019, NBC Sports notes. 2019 is when there might be more drivers renegotiating contracts and/or playing musical chairs at the top teams. 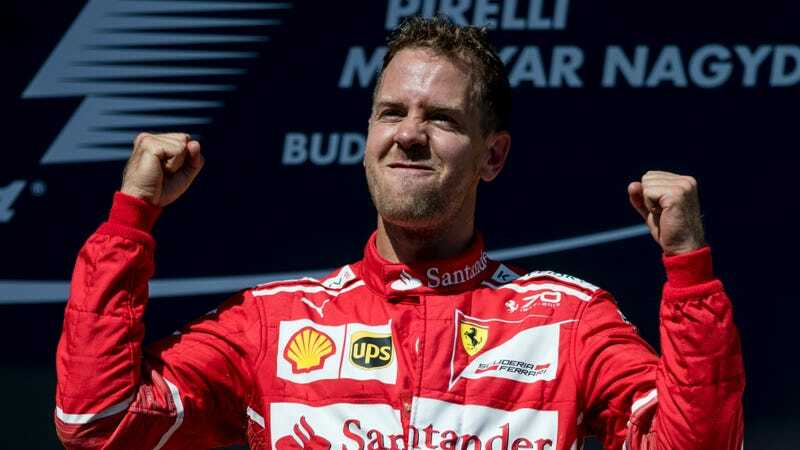 Mercedes’ non-executive chairman Niki Lauda did confirm to Sky Sports that they briefly spoke with Vettel this summer about the possibility of a drive, however, Lauda admitted that there was little reason for Vettel to switch as long as the Ferrari is a competitive car. Likewise, team head Toto Wolff insists that Mercedes and Vettel never got to any kind of contract negotiation. Of course, Ferrari did not release the particulars of the contract. However, Sky Sports notes that there’s very likely a performance-related clause in Vettel’s contract that would allow him to leave if the car doesn’t perform to Vettel’s liking. A similar clause in Vettel’s deal with Red Bull was what allowed him to come to Ferrari in the first place. For now, though, fans of Ferrari actually winning this year can breathe easy and rejoice a bit. This has been Vettel’s strongest season with Ferrari since he joined the team in 2015, and here’s hoping it continues as it’s been a lot of fun to watch.